Self-Assessment: The #1 Tool to GET A JOB! 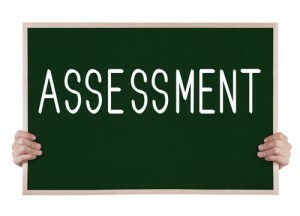 Hands holding a chalkboard with the word Assessment on it. Photo courtesy of Shutterstock. Today’s college graduates face one of the toughest job markets in history. With that said, it is important to know there ARE jobs to be had. The people who are going to get them are the people who know how to conduct an effective job search and are willing to put in the work to get them! The key to success is to identify dynamic career paths that match your major, skill set, interests and personality. Self-knowledge is the most reliable tool you can use to ensure career success, yet in tough economic times, job seekers dismiss its importance, viewing it as a luxury that must be sacrificed to obtain a “job.” They allow market forces to dictate career and job choices. That is the exact wrong way to approach your job search. There are many self-assessment tools designed to help you figure these things out. While no one test is going to provide you with all the answers to guarantee career success, any one of the tests described below, in conjunction with a trained career coach, can provide useful insights to help you design a focused but flexible job search action plan. • The online Self-Directed Search (SDS) (www.self-directed-search.com) provides an individualized interpretive report describing what you like—your favorite activities and interests—as well as information about potentially satisfying occupations. The SDS was developed by Dr. John Holland, whose theory of careers is the basis for most of the career inventories used today. According to Dr. Holland’s theory, people are most satisfied in their careers when they are surrounded by people with similar interests because it creates a work environment that suits their personalities. People are more comfortable and ultimately more successful in a work environment that rewards the traits and behaviors that come most naturally to them. • Another useful self-assessment tool is the Highlands Ability Battery (www.highlandsco.com). Based on the work of research scientist Johnson O’Connor, this online assessment tool uses 19 different timed work samples to measure the speed with which a person is able to perform a particular series of tasks. The scores, shown together on a personal profile and bar chart, reveal patterns or “clusters” of abilities that highlight your natural gifts and talents in relationship to how you learn, how you solve problems, how you communicate, and even which type of work environment best suits you. A certified provider provides a skilled analysis of the written report and helps students/graduates explore the best career options based on their natural abilities. • The Myers-Briggs Type Indicator (MBTI) is based on the theory that individuals are either born with, or develop, certain preferred ways of thinking and acting. By examining your responses to a series of questions, the MBTI defines 16 possible psychological types. These combinations indicate your preferences for whether you: 1) get energy from being around people or from time spent alone; 2)enjoy working with facts and concrete details or prefer to focus on hunches and the big picture; 3) tend to make decisions based on logic and the principles involved or on your values and promoting harmony for the people involved and 4) prefer your life to be planned and decided or prefer to go with the flow and like keeping your options open. This test is offered online (www.mbticomplete.com) without the assistance of a qualified counselor or can be administered through a qualified MBTI career counselor who will help interpret the results. o Dominance: People who score high in the intensity of the D styles are very active in dealing with problems and challenges, while those with Low D scores want to do more research before committing to a decision. o Influence: People with High I styles scores influence others through talking and activity and tend to be emotional. Those with Low I scores influence more through data and facts, not feelings. o Steadiness: People with High S styles scores want a steady pace, security, and do not like sudden change. Low S intensity scores are those who like change and variety. o Conscientiousness: People with High C styles scores adhere to rules, regulations, and structure. They like to do quality work and do it right the first time. Those with Low C scores challenge the rules, want independence, and are uninhibited by details. While you don’t need a certified career counselor to interpret the results, someone trained in interpreting DiSC would be extremely useful in terms of guiding you toward the practical application of the information on designing your career plan. Check with your career development office to see if anyone on staff is certified in any of these instruments. Once you have an understanding of your abilities and personality, you can now match it with a compatible career path. Check out ONET OnLine (www.onetonline.org) to learn more about the skills, abilities and personal attributes needed as well as tasks and work environment options for a variety of careers. Then look at Bureau of Labor Statistics Occupation Finder (www.bls.gov/ooh/occupation-finder.htm ) to learn the entry level education requirements, projected number of new jobs and median pay for the ones that match your profile. The point of entry into any field can vary wildly. In some instances, a new graduate with the technical expertise and industry knowledge may have an advantage over someone with general business or management experience but limited industry knowledge. But understanding what the job requires will enable you to find the appropriate point of entry for YOU and design a job search action plan to showcase how your unique gifts and talents meet the potential employer’s needs. Kathleen Brady, CPC is a career management coach with more than 25 years of experience helping people identify and realize their professional career goals. Brady is a sought-after industry speaker and author. Her latest book, GET A JOB! 10 Secrets to Career Success (Inkwater Press, 2013) is available at www.amazon.com, www.barnesandnoble.com, www.inkwaterpress.com/shop and other online retailers. She is a certified provider of the Highlands Ability Battery, the EnergyLeadership Index and host of GET A JOB! with Kathleen Brady on www.BlogTalkRadio/LifeCoachRadioNetwork.